SNAP Exam Details: Are you interested to join MBA in Top B-Schools? Then, here is the information about SIU SNAP Notification. Candidates who are interested and eligible can apply SNAP Exam. According to the details given by Symbiosis International University, aspirants are requested download the SNAP Application Form from its official website on www.snaptest.org. Further details of SNAP Exam Eligibility criteria will be furnished below. Many sites will issue the information about Symbiosis National Aptitude Test Dates. But that will not be in clear so we are giving the direct link of the Symbiosis National Aptitude Test Notification at the end of this page. Along with we provide the SNAP Exam Syllabus and Exam Pattern from here. 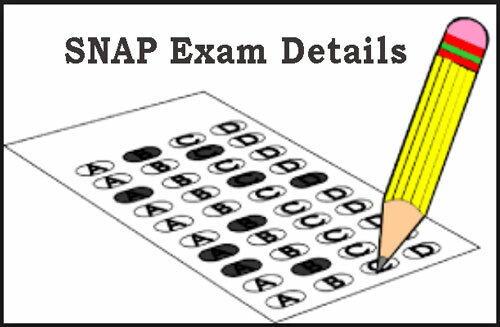 The full form of SNAP is Symbiosis National Aptitude Test. SNAP is a common written test for the admission to all the Post Graduate Institutes of Symbiosis International University. Every year SIU SNAP Notification will be released by Symbiosis International University, Pune. SIU is a private, coeducational, multi- institutional university located in Pune, Maharashtra, India. This University conducting the SNAP Entrance Exam for admissions in top B-Schools. Applicants are shortlisted for the next round of the admission process on the basis of their academic profile & SNAP Exam Score. We advice to all aspirants please check the eligibility norms before the SNAP Test Registration. For more details you may visit the official website www.snaptest.org. The candidates applying for SNAP Test Registration must have a bachelor’s degree from any recognized University. In their graduation, the candidates must have a minimum aggregate score of 50% (in case of SC and ST category must have a minimum of 45% as their aggregate score in the qualifying exam) . However, different MBA programmes will be having different criteria. Candidates have to pay application fee of Rs. 1500/- by using credit card or debit card or Bank account transfer. Applicants can either pay Rs. 1500/- in cash at any Axis Bank or Indian Bank branch in your city or they can also do the payment through demand draft (DD) of Rs. 1500/- from any Nationalized Bank in favour of “Symbiosis Test Secretariat” payable at Pune. SNAP Test will be a paper pen mode. Symbiosis National Aptitude Test is an objective type Multiple Choice Questions (MCQs). Each question has 4 responses out of which one is correct. Each wrong answer attracts 1/4th of negative mark. Total marks obtained for this test is 180 and numb er of questions is 150. The duration of the test is 2 hours from 2 PM to 4 PM. Sectional cut off will always be there. One has to score at least a minimum cut off score in each of the 4 sections. Also see: XAT Exam Details, MBA Course Details. Refer the following link fo more information abour snap exam syllabus details. Gurgaon, Patna, Guwahati, Pune, Hyderabad, Bhubaneswar, Agra, Allahabad, Lucknow, Chandigarh, Mumbai, Chennai, Nagpur, Delhi, Nasik, Jamshedpur, Ahmedabad, Kanpur, Faridabad, Noida, Surat, Indore, Vashi, Jaipur, Visakhapatnam, Kochi, Bangalore, Kolkata, Bhopal, Kolhapur.